1, Capacity: 350KG. Not easy to hollow and broke. 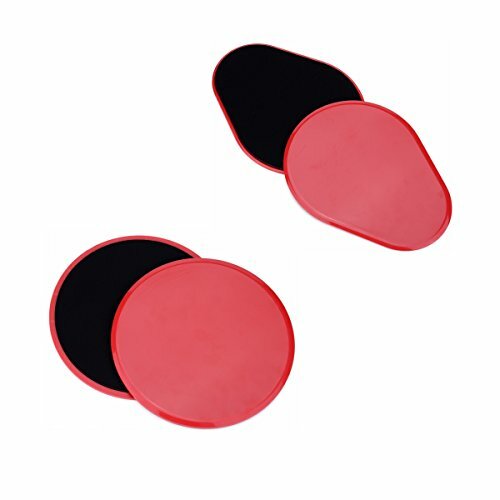 3, Extra Thickness, double sided exercise sliders work smoothly on all surfaces. 6, Two Side: Can be use at the both side. 1, Sliders are designed to be ultra- light and portable. Which make them perfect for your gym or travel bag. 2, Slide gliding disc deliver an unparalleled core workout. They can be used to target all muscle groups, from chest to legs. Core Slider: Using Core Sliders requires constant core stabilisation which delivers an incredible core workout. Entire Body Workout: Intensify your favorite moves such as lunges, planks and bridges by introducing a balance challenge. Fitness Gliders allow you to perform exercises that target every muscle group, providing great sport and real-world carryover conditioning. Fit for all surfaces: No matte at home or at the gym use our Core Sliders on any surface such as Wood, Carpet, Laminate or Tile. Exercises every muscle group: Strength and Condition your entire body with a low impact weight-bearing workout since your body is in constant contact with the surface. Especially the core.